I told my book club how excited I was for the new wave of cookbooks being published this fall and the general response was, “Cookbooks? Who uses cookbooks anymore? Just google your ingredients and find a recipe online!” Well, call me old-fashioned, but I still love great cookbooks. How else are you going to know what to search for online? And also, a great cookbook needs to be savored as a whole for maximum inspiration. I’ll be honest here. A lot of the cookbooks that come out each year are at least some part garbage. They either have recipes you’d never want to cook or sloppy, untested recipes. Or both. Or they aren’t arranged nicely and by that I mean a beautiful photo on one side and a great recipe on the other. But let’s ignore those bad ones for the now. Because the ones that are great? The cookbooks that change how you eat, how you celebrate, how you cook, how you live? The good ones? Those cookbooks come out in the fall! Good news! Ruth Reichl has a new memoir chock full of recipes called My Kitchen Year: 136 recipes that Saved My Life. It chronicles her difficult time after Gourmet magazine folded and she found herself again through cooking. Essential Emeril: Favorite Recipes and Hard-Won Wisdom from My Life in the Kitchen by Emeril Lagasse is his most personal cookbook yet. The famous chef reveals iconic dishes, classic cooking lessons, and personal anecdotes from his life in the kitchen. Heart & Soul in the Kitchen by Jacques Pepin is an intimate look at the celebrity chef and the food he cooks at home with family and friends — 200 recipes in all. Fantastique! In Kitchen Gypsy: Recipes and Stories from a Lifelong Romance with Food, Joanne Weir of television fame and who learned from Alice Waters offers the cherished dishes and lessons that have shaped her culinary journey. This is Camino by Russell Moore is a cookbook about the unique, fire-based cooking approach and ingredient-focused philosophy of Camino restaurant in Oakland, CA. At Home in the Whole Food Kitchen: Celebrating the Art of Eating Well is by Amy Chaplin who is the former executive chef of New York’s renowned vegan restaurant Angelica Kitchen and it celebrates each season with recipes that show off local produce at its peak. Nopi: The Cookbook by Yotam Ottolenghi is a cookbook from the best restaurant in London (Nopi) and features 120 new recipes. Smashing! Breakfast: Recipes to Wake Up For by George Weld and Evan Hanczor of the Brooklyn Restaurant, Egg. This is a delicious ode to morning foods, featuring eggs, biscuits, meats, and pancakes you’ll want to start every day with. How to Eataly: A Guide to Buying, Cooking, and Eating Italian Food is by Oscar Farinetti. “The more you know, the more you will enjoy” is the philosophy behind this essential compendium of Italian cooking. Zahav: A World of Israeli Cooking by Michael Solomonov who is chef and co-owner of Philadelphia’s Zahav restaurant reinterprets the glorious cuisine of Israel for American home kitchens. Near and Far: Recipes Inspired by Home and Travels is by Heidi Swanson who is known for combining natural foods recipes with evocative, artful photography. She circled the globe to create this mouthwatering assortment of 120 vegetarian dishes. Honey & Co: The Cookbook by Sarit Packer brings the flavors of the Middle East to life in a wholly accessible way, certain to entice and satisfy in equal measure. A Real Southern Cook: In Her Savannah Kitchen is the first cookbook by Dora Charles who is the real deal. Here she divulges her locally famous Savannah recipes — many of them never written down before — and those of her family and friends. In America: Farm to Table: Simple, Delicious Recipes Celebrating Local Farmers bestselling author and world-renown chef Mario Batali pays homage to the American farmer — from Maine to Los Angeles — in stories, photos, and recipes. Eat Fresh! Heartlandia: Heritage Recipes from Portland’s Country Cat by Adam and Jackie Sappington offers soulful, heartland-inspired comfort food from Portland’s popular The Country Cat Restaurant. Put a bird on it! The Beetlebung Farm Cookbook: A Year of Cooking on Martha’s Vineyard by Chris Fischer whose cooking combines practical, rural ingenuity with skill acquired in the world’s leading kitchens. The result is singular and exciting. Food 52: Genius Recipes: 100 Recipes That Will Change the Way You Cook by Kristen Miglore is an essential collection of more than 100 foolproof recipes from food luminaries such as Julia Child, Alice Waters, and David Chang — curated, introduced, and photographed by the team behind the leading foodwebsite Food52. These are inventive recipes that rethink cooking and are nothing short of genius. Two Moms in the Raw: Simple, Clean, Irresistible Recipes for Your Family’s Health is by Shari Leidich, the founder of the national award-winning healthy-snack company Two Moms in the Raw and includes raw, cooked, and gluten-free meals. Healthy! The Vibrant Table: Recipes from My Always Vegetarian, Mostly Vegan & Sometimes Raw Kitchen by Anya Kassoff is a feast for the senses. From small sides to savoury meals and sweet indulgences, each nourishing recipe tells a story of a balanced and well-fed lifestyle, centered around the family table. This is one beautiful book! The Whole 30: The 30-Day Guide to Total Health and Food Freedom by Melissa Hartwig and Dallas Hartwig is the step-by-step, recipe-by-recipe guidebook that will allow millions of people to experience the transformation of their entire life in just one month. My Pantry by Alice Waters is an accessible collection of essays and recipes which introduces the author’s philosophies about making one’s own provisions using seasonal, organic and healthy artisanal foods. Tacos: Recipes and Provocations is by Alex Stupak. Through recipes, essays, and sumptuous photographs, the 3-Michelin-star veteran makes the case that Mexican food should be as esteemed as the highest French cooking. Theo Chocolate: Recipes and Sweet Secrets from Seattle’s Favorite Chocolate Makers is by Debra Music & Joe Whinney. Who doesn’t love chocolate? Here are delicious sweet and savory chocolate recipes, along with the fascinating story of how North America’s first organic and Fair Trade chocolate factory came to be. In Seattle! Wine Folly: The Essential Guide to Wine by Madeline Puckett has lots of information in an easy-to-read format. Some of it is basic — like choosing glasses and how to serve — and most is really good information — like the entire ‘Styles of Wine’ section. So, there you have it: Something for everyone. 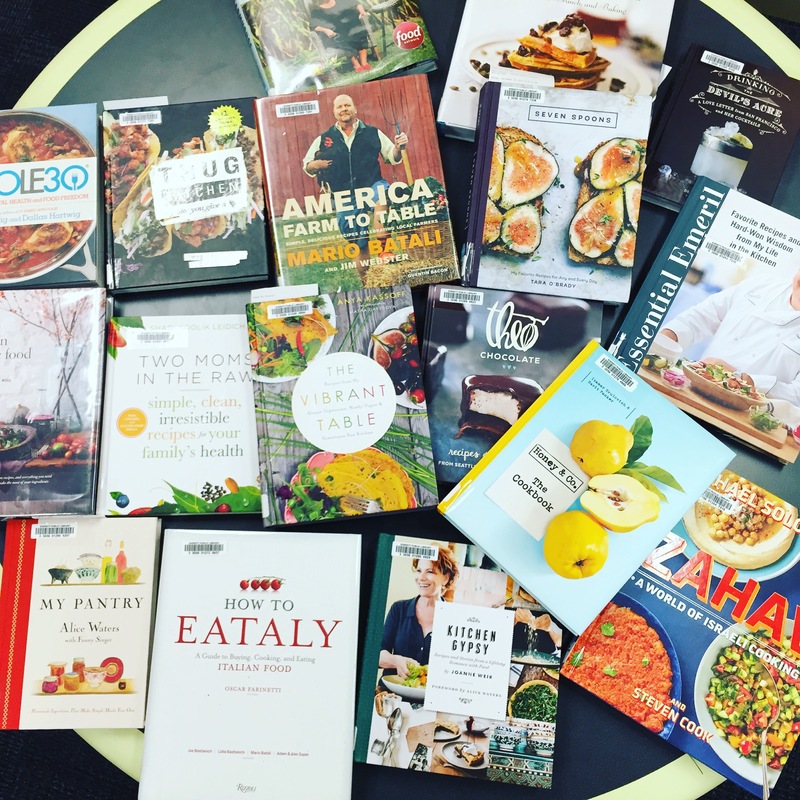 Come on down to the library to check out one of these cookbooks that will change how you eat, how you celebrate, how you cook, how you live. See you there! This entry was posted in Book Review, Nonfiction and tagged cookbooks, Nonfiction by Leslie. Bookmark the permalink.